Covered call writing is a low-risk option-selling strategy that allows us to generate monthly cash flow in sheltered and non-sheltered accounts. One of the main reasons this has been the go-to strategy in the stock portion of my portfolio is related to the fact that the strategy can be crafted to specific investment scenarios and goals. In this article, we will highlight three ways selling call options can assist us in generating these income streams. We first buy a stock or ETF based on fundamental, technical and common sense screens. We then sell an option based on overall market assessment, charts technicals and personal risk tolerance. Once our positions are established, our position management skills may be needed. Portfolio mix turns over frequently especially due to our rule of avoiding earnings reports. We already own the shares and want to enhance annualized return by selling call options. Frequently, the stocks are of low cost basis and are dividend-bearing. We may have concerns regarding exercise and sale of our securities due to possible tax consequences if not trading in sheltered accounts as well as loss of the dividend income streams. Note how the cost of the put and the cash generated from the sale of the call cancel each other out. Generating income from stocks or exchange-traded funds we already own can be accomplished using covered call writing. The manner in which we use this conservative option-selling strategy will depend on the specific situation our portfolio resides in as well as our goals and concerns. Saturday morning 3-hour workshop at the Plainview Holiday Inn. I am the only speaker and plan an information-packed presentation covering 5 actionable ways to make money or buy a stock at a discount using both call and put options. Discounted fee through 8/31/16. Save the date: Our next Blue Hour webinar, FREE to all Premium Members, will be broadcast on 9/29/2016 at 9 PM ET. The topic is Using Put Options to Buy and Sell Stock. This a new presentation which will be presented for the first time on September 29th. Registration will open in a few weeks. You will receive notification. For the week, the S&P 500 moved slightly down by 0.01% for a year-to-date return of +6.85%. The charts continue to point to a bullish short-term outlook. In the past six months the S&P 500 rose by 14% while the VIX declined by 45%, still a moderately bullish picture. I would like your thoughts on selling in the money cash secured puts. If you think a stock is oversold, you can get quite a premium for selling in the money puts. Have you ever done this? If you would like more specifics on this particular trade, I can provide them to you. I have been a BCI member for less than a year, so obviously I am still a novice, but I seem to have more clarity as each new options period comes and goes. Thanks for sharing all of your wisdom. My personal preference is to sell out-of-the-money puts and perhaps near-the-money puts when the overall market is bullish. My goal is to generate income and avoid exercise. When I sell a put to buy a stock at a discount, I may enter the world of in-the-money puts. Now it’s important to understand why we get such larger premiums because there is no free lunch! In-the-money puts (and in-the-money calls for that matter) have an intrinsic value component that out-of-the-money and at-the-money strikes do not have. So let’s say a stock is trading at $56 and we sell the $60 put for $7. Now that’s a juicy premium but a bit deceiving. Of the $7, $4 is intrinsic value and money we can lose if exercised (probable). We are agreeing to buy the stock at $60 that’s trading at $56. If share price remains the same we lose $4 on the stock side, leaving a profit of $3 and a likely assignment scenario. Selling the out-of-the-money put could generate a similar time value return and decrease the chance of exercise. Of course, if the stock takes off to the moon leaving the in-the-money strike now out-of-the-money, we are big winners having dodged a bullet. If you want to send me a specific example, I may use it in a future blog article or “Ask Alan” video. The BCI strategy is “consistent gains at low risk”. Selling ITM puts is more like high risk gambling for big gains. You get no protection against further decrease of the stock. Usually a stock is oversold for some reason, and the big boys (institutionals) who move the market are much better informed than we are. Market makers are generally smarter then us normal mortals, it is their fulltime job at the bank, and they get to see the order flow coming in. 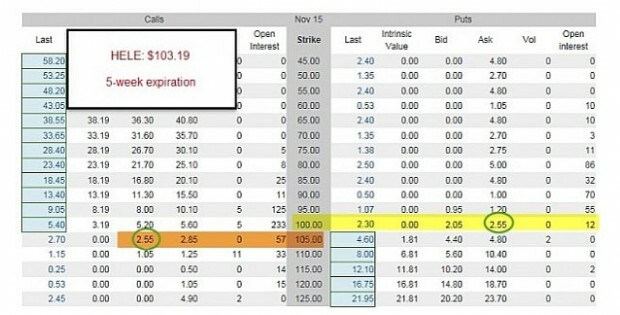 To new members: Notice how in-the-money puts represent a riskier approach to option-selling than out-of-the-money puts whereas in-the-money covered calls represent a more conservative approach to covered call writing than out-of-the-money calls. Understanding the “moneyness” of options is so important to our success and that’s why I’ve devoted so much attention to this topic over the years. I am new to your service and wanted to know why there is an ex dividend date column in your stock reports. Sorry if you’ve explained this previously. Ex-dividend dates are important to covered call writers because dividend distributions are the main reason early exercise of options may occur (extremely rare even when dividends are distributed). If early exercise does take place, it will usually be the day prior the ex-dividend date. For those who want to retain the shares, knowing this date will allow us to take action to avoid early exercise. My compliments once again for a great blog article. I have a couple smarter than me investing friends who turn their noses up at options and will not get within a mile of them. They are good business people. But they have heard only the woes of options speculators. I tell them “Covered calls are not the casino. It’s like how you would rent out a property you own with an option to buy. There is no reason not to do it with at least some of your IRA stocks”. There is no one strategy that is right for every investor, including covered call writing. However, it is unfortunate when some eliminate any strategy without educating themselves and going by what they’ve heard from others. Your property rental analogy is an excellent one but I wouldn’t totally eliminate the casino analogy. With covered call writing, we are the casino just not the players at the tables. This week’s Weekly Stock Screen And Watch List has been uploaded to The Blue Collar Investor Premium Member site and is available for download in the “Reports” section. Look for the report dated 08/19/16. On the topic of selling puts, would I be correct in saying that selling the OTM puts are equivalent to the the ITM CC at that strike? So, if I like the idea of selling OTM CC, than I could sell a put at one strike ITM, instead of one strike OTM CC. Am I correct so far? Also, just as ITM CC are very conservative strategy, would I be correct in saying that OTM CSP would be exactly same at that strike? You may find this an interesting read. Keep in mind that this is talking about European-style options (only able to be exercised at the expiration date) instead of American-style options (able to be exercised at any point in which the contract is in force). Most academic work regarding options is boiled down to European options because quantifying an American option is far too difficult (the theoretical reality is that every second there’s a decision to exercise or not exercise whereas practically that’s not true of a prudent, rational investor). Thanks so much for sharing this article with the BCI community. Your general assessment is correct but I would eliminate the word “exactly” OTM puts and ITM calls both are conservative approaches to option selling which offer protection against share depreciation. The more concerned we are regarding the stock or overall market the deeper ITM we should go with calls and OTM we should go with puts. Since ITM calls have an intrinsic value component which OTM puts do not have, the premium generated from the call will be greater. Now, the time value component of the call will be similar to that of the put but usually not exactly the same. Most put-sellers do not want to take possession of the shares and so the use of ITM puts for purposes of income generation is less frequently used when compared to covered call writing. Put-selling also requires a higher level of trading approval for most brokerages. Selling OTM puts and ITM calls are similar but not precisely the same. Alan, I exclusively trade ETF’S. I was in the SMH Aug 62 call which was CALLED AWAY Monday 8/15 five (5) trading days before expiration Friday. I can only ASSUME the reason for a early assignment was an ex dividend date for the underlying am I CORRECT in this assumption or could there be another explanation? 1- A mistake made by a retail investor who didn’t realize that selling the option would have accomplished the same profit without the obligation of owning the shares…I’ve seen this happen. 2- The option-holder wanted to own the shares and bought the call with that objective depending on share behavior. Then with (if) the option trading at parity (all intrinsic value) and (if) commissions being less expensive for exercise than selling the option and buying the shares, early exercise occurred. Firstly I just want to say thanks for your YouTube clips and now that I am a member, I am blown away by the amount of content on your site the help direct people. I have been trading options for years, and as much as I love it, I don’t make consistent returns & have started to explore other means to making consistent returns on the market. Hence, this email. I can’t believe just how quickly my account has grown since the beginning of June, 2016 just by changing to CC strategies. As an options trader, I have always approached my trading from a position of knowing what the potential risk is for a position & then decided if that is a risk I am prepared to take. To cut a long story short, my account has gone up quickly because my returns have been in excess of 15% for each trade. I thought I was doing great until I came to your site and seen that you only trade stocks with less volatility. As you are the professional trader, I am interested in this position. I understands that stocks with higher volatility has the potential to swing around and therefore it can go against you quickly, but if I can get into a position that has a 15% return or greater and if the time I am in this position is limited what is the problem? The way I approached this trade was that it was a short term position (june 6th- June 9th) & as I felt good about the technical’s of the chart, as long as the stock didn’t fall below my breakeven, I would be safe and would make money if I chose to sell the shares after this date (assuming that the stock depreciated in value below $15.40 but stayed above $13.50). Am I understanding this correctly, and if so, is there a reason you don’t promote shorter term, weekly trades that have such a high return? First let me compliment you on your decision to enter trades based on your personal risk tolerance. This is such an important factor and it is not the same for every retail investor. As far as trading high-volatility securities, I learned my lesson the hard way many years ago which I archived in one of my books with Taser (TASR). As studies were being done in the 1990s regarding the efficacy of stun guns, TASR had a huge implied volatility that generated impressive time value returns. So I bought a large position and sold options generating 8% per month as TASR went from $36 to $6…not my finest moment but definitely a lesson learned. I strongly believe that there are no free lunches and I always ask myself why there are market-makers taking the other side of these trades. I view downside protection as the amount of intrinsic value protecting the time value component of an in-the-money call option. My focus is on generating income and not on breakeven. Every option trade has a breakeven but that’s not where my focus lies. The Ellman Calculator will show both DP and breakeven statistics. So happy for your recent success. 1. It will be very nice if you can have a chapter for beginners for how to buy and sell Options. A. Where the money goes for ‘intrinsic value’ when the options expire worthless or if the options are exercised or sold? 2. Are there anyways to protect my invested capital on sudden downfall for writing put? I want to write protective put but I don’t want to lose my shares. 2- We can use protective puts to protect against catastrophic share decline and if we want to retain our shares we can sell the now appreciated put rather than exercising it. How often do you monitor your positions to see how they compare to the strike price and/or to the break-even? Or do you enter conditional buy/sell orders based on predetermined exit strategies so that your exit strategies are automated and so you don’t have to continually monitor your positions? What is your timing: if a stock price is declining within the first few hours, do you execute an exit strategy or do you give it more time? Does it depend on the general market trend and other influencing factors. One of the many things I admire about Alan is he will get back to you with a thoughtful answer to your every question. In the mean time I hope you do not mind a few observations from a fellow traveler who has been beaten up and dragged around the block a few times :)! Don’t sweat the small stuff. If you are watching stocks on an intra day basis trying to make decisions you are on a slippery slope. A month is neither an instant or an eternity. Just a reasonable time to own a stock and sell a covered call or sell a cash secured put. The process can actually be automated. Once the initial trade is entered we can immediately set a buy-to-close (BTC) limit order at 20% and then change to 10% mid-contract. For example, had we sold an option for $2, we immediately set a limit order (GTC- good-til-cancelled) at $.040 (or less). If not executed, we change to $0.20 mid-contract. It is important that we don’t over-react to every whipsaw in share price but it is also critical we take advantage of all exit strategy opportunities. Based on the recent premium member survey many of you responded to, there is an interest in a report specifically geared to blue chip stocks for option-selling strategies. The BCI team is considering adding an additional quarterly report where we screen the 30 Dow Jones Industrial stocks for price performance in 3-month and 1-year time frames and select those that have out-performed the S&P 500 in both screens. The report will include price at the time of report publication, % returns in both time frames, earnings report dates, dividend yield and ex-dividend date information. I have placed a draft of this report in he “Resources/downloads” section of the member site (right side of page). Scroll down to “B”…Blue Chip Report: 8-2016. Let us know your thoughts to help us to decide if we will be adding this report to our member benefits package. 1) can I do my covered call order when the market is closed? 2) how long after a person has held their position do you start to explore using the exit strategies and how far away from expiration should one use them as well? When should I consider cutting ties with a stock after it has drop? I know the exit strategy of selling deep in the money. But was wondering when to stop using. The first step is always to buy back the option when it meets our 20/10% guidelines. Now we can roll down, wait to “hit a double” or sell the shares. Regarding selling: I am more likely to sell when the stock is under-performing the overall market. Some members like a more specific guideline. If a stock drops 8-10% from the price when the trade was entered is a reasonable time to sell. This does not preclude using our exit strategy arsenal during that price decline. 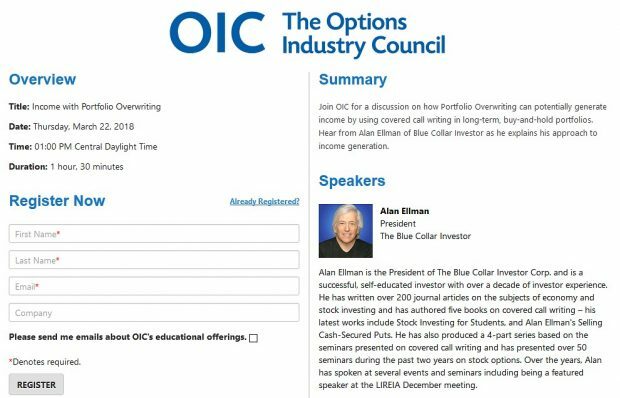 Based on the recent premium member survey many of you responded to, there is an interest in a report specifically geared to blue chip stocks for option-selling strategies. The BCI team is considering adding an additional quarterly report where we screen the 30 Dow Jones Industrial stocks for price performance in 3-month and 1-year time frames and select those that have out-performed the S&P 500 in both screens. The report will include price at the time of report publication, % returns in both time frames, earnings report dates, dividend yield and ex-dividend date information. I have placed a draft of this report in the “Resources/downloads” section of the member site (right side of page). Scroll down to “B”…Blue Chip Report: 8-2016. Let us know your thoughts to help us to decide if we will be adding this report to our member benefits package (at no extra charge). Reminder: member rates will increase starting 9/1/2016 but WILL NOT EFFECT YOU. Your rates are grandfathered into the current lower rates and will not change. Thanks for your loyalty. This weekend’s stock report may be published a few hours later than usual because we have a few team members on vacation. When there is potentially market shaking news (The FED)should would you suggest being in or out of the market? The short answer is that I am almost always fully invested in the market with rare exceptions (last quarter 2008 and moved to 1/3 cash pre-Brexit). Our greatest risk that occurs repeatedly is the impact of disappointing earnings reports and we’ve solved that problem at BCI by avoiding them. Now, there are always going to be global economic and geo-political concerns that impact our portfolios but usually in the short-term like post-Brexit). Corporate profits will ultimately have the greatest impact on our returns. When there is market concern greater than usual we can take more conservative option-selling positions like favoring deeper in-the-money calls or out-of-the-money puts, protective puts, low beta stocks, ETFs etc. Most scenarios are quite manageable. Alan, Just in response to your previous comment, what if we already have opened up our stock/option positions and it is too late to look for ITM call strikes,etc, and for when I may had even sold the calls OTM as well, because of me not knowing that there would be any FED meeting for interest rate rises? Do I look at just managing the trade(s) with exit strategies because it is too late for anything else? 1- Close the position before the event occurs. There will always be events and concerns regarding the stock market especially now that we are in a global economy. As long as we have mastered the 3 required skills (stock selection, option selection and position management) successful results can be achieved. If I wanted to buyback the OTM calls for ITM calls when I think my stocks will be affected by some global event, or interest rate rise like we have presently, then can’t I do this as soon as possible rather than wait for price to reach the 20%/10% level? Yes, in unusual circumstances (Brexit a recent example) we can veer from our normal trading strategy but generally we should have a structured plan with rules and guidelines based on sound fundamental, technical and common sense principles. Emotional trading is off the table.